"In the first fight, in the first six rounds, Dereck really established himself," Haye told Sky Sports. "In the last six rounds, he took his foot off the pedal, laid on the ropes and took some unnecessary punishment. It was an evenish fight. "This time, I'm positive Derek can do for 12 rounds what he did [for the first six] and some. "For me, Dillian's really going to need to raise his game to stay in there with him. It's going to be exciting whichever way you cut it." "It's been challenging, but I always knew that would be the case," he said. 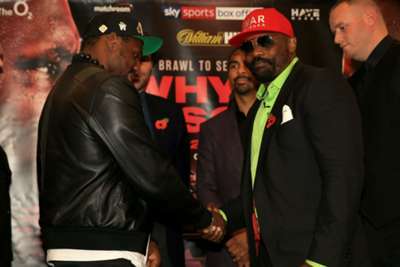 "Dereck Chisora is a man who does things his own way and my whole plan was to do things a little my way and meet me in the middle. He's more than done that. "Talking to his coaches and his team, they said they've never seen him in such condition, they've never seen him so focused and dedicated. "He's watching what he eats, what time he goes to sleep, he's not going out to restaurants and meeting his buddies. He's just eating, sleeping, training, eating, sleeping training. "Going back to seven or eight weeks ago, he was doing three or four sessions a day, putting in the graft like never before."